I want to share with you this infographic from the World Bank. 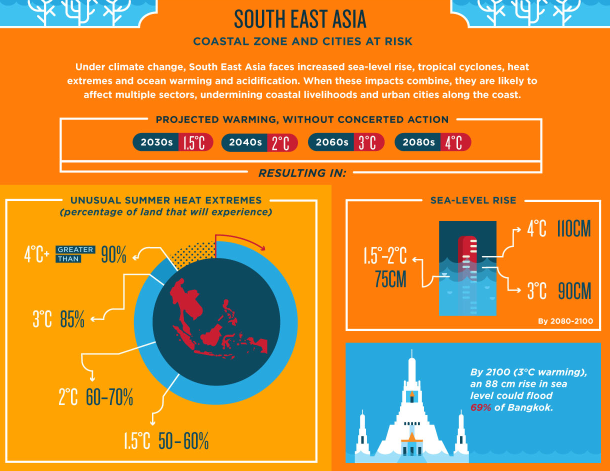 It says what would happen to the South East Asia region should the temperature rise due to climate change. The report says that coastal areas and cities like Manila will be greatly affected by rising sea levels and heat extremes. Turn Down the Heat: Climate Extremes, Regional Impacts and the Case for Resilience, was prepared for the World Bank by the Potsdam Institute for Climate Impact Research and Climate Analytics. The report paints a rather bleak scenario: if the world warms by 2°C – which may be reached in 20 to 30 years – there will be widespread food shortages, unprecedented heat-waves, and more intense cyclones. In the near-term, climate change, which is already happening, could greatly impact the lives of individuals who have done little or nothing in raising the Earth's temperature. The report adds that countries in the South East Asia region are particularly vulnerable to the sea-level rise, increases in heat extremes, increased intensity of tropical cyclones, and ocean warming and acidification because many are archipelagoes located within a tropical cyclone belt and have relatively high coastal population densities. The degradation and loss of coral reefs will diminish tourism, reduce fish stocks, and leave coastal communities and cities more vulnerable to storms. In the Philippines the report said that the biggest risks are due to more severe impacts storms will have on informal settlements and coastal communities.